I saw this sign at Ikea last night. 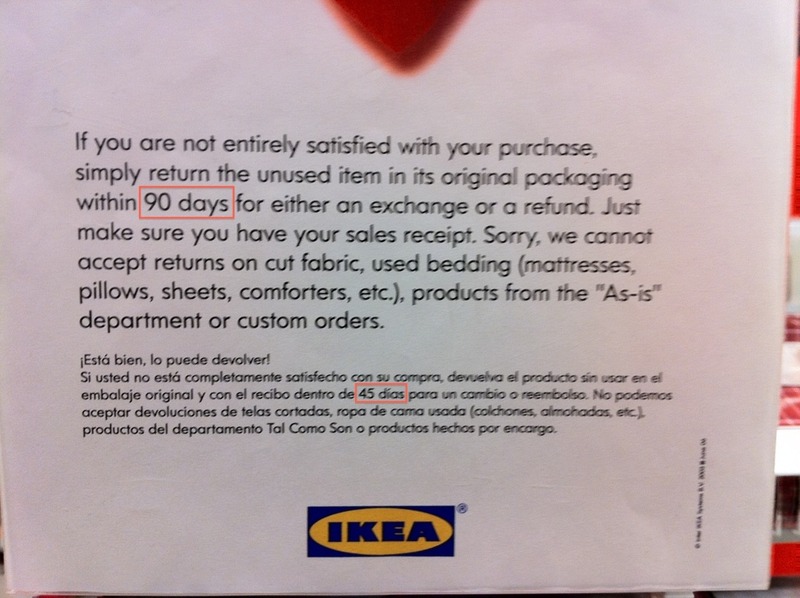 You have 90 days (45 días) to return unopened merchandise. I assume that they just forgot to update the Spanish translation to 90 days when they updated the English. MySQL wants to be Ikea of the database market. (via) The headline on its own is great, but MySQL and IKEA are actually pretty good parallels. The people with $10,000 couches and $100,000 databases will always deride the cheapness, lack of certain design flourishes, and the fact that you generally have to put it together yourself. But that misses the point. It’s cheap, it does what it’s supposed to, and you can always replace it with the real thing when you start making enough to afford the name brand stuff. Plus, for people who don’t know the benefits of the name brand stuff, we are perfectly content with our cheap knock-offs.